Originally, Cody and I planned to spend our Sunday going to see Lone Survivor in SDX; however, I happened to check facebook an hour before we were to leave, and Mariner Sails made a post, a post too tempting to by pass. 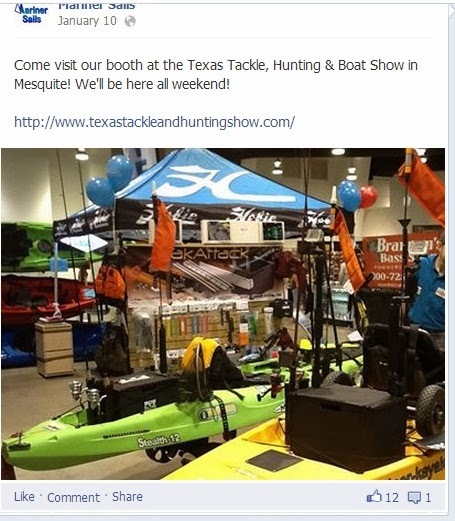 So, we changed our plans and headed to the Mesquite Rodeo to attend the Texas Tackle, Hunting, and Boat show. Oh, what awaited me, was a kayak for which I had been longing--the Native Slayer PROPEL. I field-tested the NuCanoe, Wilderness System, and Native Slayer 14 foot in July, but none were set-up for a short person. Many years previously, I had field tested the Native 2010 Propel, and I could not keep my feet on the pedals for the entire cycle. 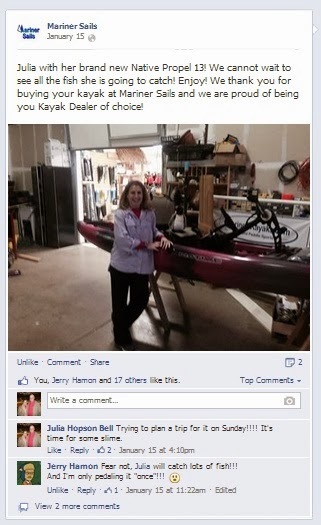 After field testing Jackson kayaks in August, I knew they were not the boat for me, either. I nearly drowned on the White River in August when I flipped a Wilderness System Tarpon 120, so I put kayaks on a hiatus. I climbed back in that 'yak for Oktoberfisch on the South Llano River, so I knew I still wanted a kayak, but one that was designed for my needs and laundry list of wants. Kayaking took a back burner again when suddenly, I was not well and was put on bedrest and then major surgery throughout the remainder of 2013. Going through rehab really put me back in great shape, so I thought I'd look at kayaks, again. The Mariner Sails booth was at the back of the main showroom floor, and when I rounded the corner, Gator Bait awaited me, and it was love at first site! Set up on kayak stands, several team members steadied the kayak and allowed me to climb on top, adjust the seat, and pedal just to see if my feet could stay on the pedals for the entire cycle. We joked that it looked like they were pallbearers holding my coffin, which it very well could be--one day, far, far away. Cody made the purchase as an early Valentine's/belated Thank-you-for-not-dying gift (Cody's words). We picked it up on Monday, made a few mandatory purchases, and on Sunday, it sailed on its maiden voyage on the Navasota River along TPWD's Limestone Bluffs Paddling Trail at Fort Parker SP and the Confederate Reunion Grounds. I didn't catch any fish, but I so love this boat. It's name really isn't Gator Bait; that's the factory name of the paint job--purple, pink, and a little bit of gray! I haven't named the 'yak, yet, but I will after some RBT--River Bonding Time! BTW, I bought a Slayer Propel 10 and it is GATOR BAIT!